Beloved hitchhiking robot hitchBOT was destroyed by vandals in Philadelphia over the weekend, and everyone wants to know who would do such a thing. We may soon have an answer. Vlogger Jesse Wellens claims to have security camera footage of hitchBOT’s demise. Wellens, whose video blog BFvsGF has over 7.3 million subscribers, was among the last people to see hitchBOT in one piece. 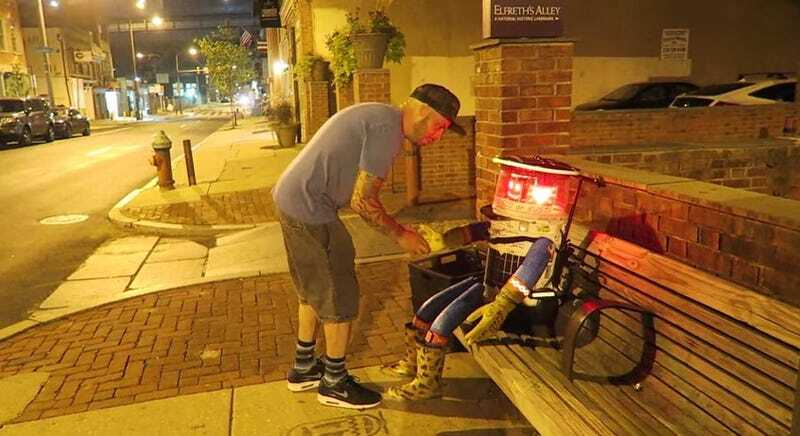 In a video posted Saturday, Wellens and his vlogger companion Ed Bassmaster can be seen driving the robot around before dropping off hitchBOT on a bench in Philadelphia’s Old City neighborhood. Bassmaster (pictured above with hitchBOT) has been trolling news stations by giving the name Always Teste, a character he does in BFvsGF videos. HitchBOT’s creators are disappointed to see the experiment ended so early, but there’s no word yet on whether the hitchhiking robot will be rebuilt. That image shows hitchBOT in a pile of leaves, with his head missing and his arms torn off. The robot was found behind a wall less than a foot from where the vloggers left him. HitchBOT’s Canadian creators have no interest in tracking down his assailants. But the internet is on the case. It appears nobody knows who destroyed hitchBOT, but my inbox has already been flooded with theories. One theory emailed to me claimed that the cab driver in the BFvsGF video circled back later. But there’s also the possibility that the culprit might be one of Wellens’ own fans, since he tweeted out hitchBOT’s location to his over 820,000 followers on Twitter. Just as plausibly, someone randomly walking by might have beheaded hitchBOT and stolen his innards for parts. We can’t know for sure until Wellens posts the surveillance video he claims to now have. But with his history of pranks (Wellens also runs the YouTube channel PranksvsPranks), it’s possible we might never get a straight answer to this robo-murder mystery. Update: Video has surfaced of the jerk who killed hitchBOT.